listen)) is a city on the southwest coast of Finland at the mouth of the Aura River, in the region of Southwest Finland. Turku, as a town, was settled during the 13th century and founded most likely at the end of the 13th century, making it the oldest city in Finland. It quickly became the most important city in Finland, a status it retained for hundreds of years. After Finland became part of the Russian Empire (1809) and the capital of the Grand Duchy of Finland was moved to Helsinki (1812), Turku continued to be the most populous city in Finland until the end of the 1840s, and it remains a regional capital and an important business and cultural center. The Swedish name Åbo may be a simple combination of å ("river; creek; large stream") and bo ("dwelling"). As this pattern does not appear in any other Swedish place names in Finland, etymologists believe there could be a different explanation. One theory is that it comes from "Aabo", the Finnish rendition of the Russian "Avram" (Abraham), which could also be the origin of the name of the river Aura. There is however an old legal term called "Template:Illm" (meaning roughly "right to live at"), which gave citizens (called "åbo") the inheritable right to live at land owned by the crown. Although archaeological findings in the area date back to the Stone Age, the town of Turku was founded in late 13th century. The Cathedral of Turku was consecrated in 1300. After the Finnish War, which ended when Sweden ceded Finland to Imperial Russia at the Treaty of Fredrikshamn in 1809, Turku became briefly the official capital, but soon lost the status to Helsinki, as Emperor Alexander I felt that Turku was too far from Russia and too aligned with Sweden to serve as the capital of the Grand Duchy of Finland. The change officially took place in 1812. 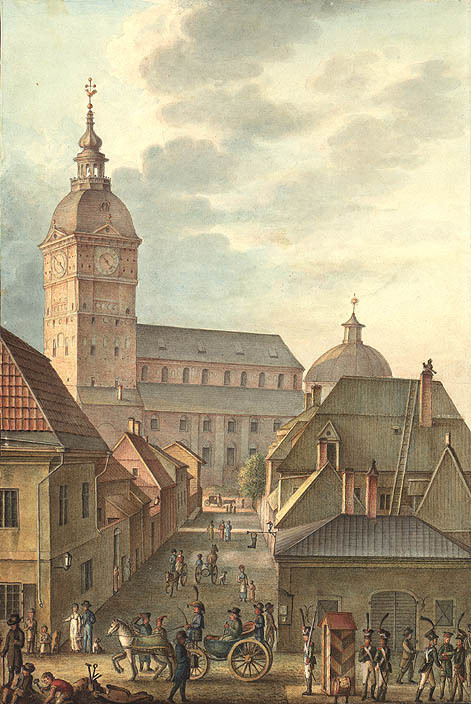 The government offices that remained in Turku were finally moved to the new capital after the Great Fire of Turku, which almost completely destroyed the city in 1827. After the fire, a new and safer city plan was drawn up by German architect Carl Ludvig Engel, who had also designed the new capital, Helsinki. Turku remained the largest city in Finland for another twenty years. In the 20th century, Turku was called "Finland's gateway to the West" by historians such as Jarmo Virmavirta. The city enjoyed good connections with other Western European countries and cities, especially since the 1940s with Stockholm across the Gulf of Bothnia. In the 1960s, Turku became the first Western city to sign a twinning agreement with Leningrad in the Soviet Union, leading to greater inter-cultural exchange and providing a new meaning to the city's 'gateway' function. After the fall of Communism in Russia, many prominent Soviets came to Turku to study Western business practices, among them Vladimir Putin, then Leningrad's deputy mayor. 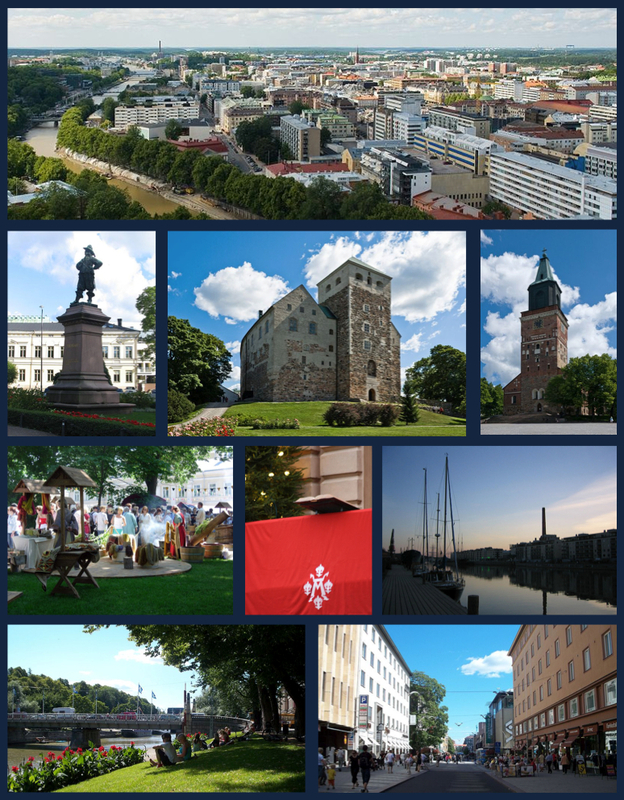 Situated by the Baltic Sea and sheltered by the islands of the Archipelago Sea, Turku has a humid continental climate. Like much of southern Finland, the city experiences warm summers, with temperatures ranging up to 30 °C (86 °F), and relatively cold winters with frequent snowfall. The warmest month of the year is July, with an average temperature of 17.5 °C (63 °F), whereas the coldest month is February. The average year-round temperature is 5.5 °C (42 °F). Winter usually starts in early December, and spring in late March. Operational since 1955, the city's weather station is located at an altitude of 47 metres (154 ft) at Turku Airport. MS Oasis of the Seas, the world's largest passenger ship was built in Turku. The Cathedral of Turku, one of the most notable historical buildings in Finland. The city has two football teams playing at the top national level, the Veikkausliiga: FC Inter and TPS, which is playing in second highest level Ykkönen, but TPS is one of the oldest football clubs in Finland. Both teams play their home matches at Veritas Stadion in the district of Kupittaa. HC TPS of Turku is one of the most successful teams in Finnish ice hockey history. It plays in the Finnish top league, SM-liiga. HC TPS has won the national championship 11 times, the latest being from season 2009-2010. HK Arena, located in the Artukainen district, is used as the venue for HC TPS games. Turku Titans is a lacrosse club based in Turku with a relevantly successful history with three silver medals and one gold medal in the national lacrosse league in Finland. The Titans women's team has also had a successful history. The FIL U19 2012 World Lacrosse Championships are also held in the city. The city council and city board have long been dominated by the Social Democratic Party (SDP) and the National Coalition Party (Kokoomus/Samlingspartiet), with approximately equal representation. Currently, the council has 67 members, with 19 from Kokoomus and 14 from SDP. The other major parties in the council are the Green League (10 seats), the Left Alliance (9 seats) and The Finns (6 seats). The current chair of the city board is Minna Arve from Kokoomus. For a city of its size, Turku has a moderate public transport network of bus routes, which is comparable to bus network of similar-sized Tampere. The bus network is managed and supervised by the City of Turku Public Transport Office (Finnish: Turun joukkoliikennetoimisto, Swedish: Åbo kollektivtrafikkontor), and is operated mainly by private companies. Regional buses are operated by private companies, most importantly TLO, with very frequent services especially to the neighbouring cities of Naantali, Raisio, and Kaarina. Turku Airport is located 8 kilometres (5 miles) to the north of the city centre, partly in the neighbouring municipality of Rusko. There are also daily ferry services from the Port of Turku to Sweden and the Åland Islands, operated by Silja Line, Viking Line and SeaWind Line. These are something of a Finnish cultural tradition (see ruotsinlaiva), and people often travel long distances across Finland to Turku just to take a cruise across the Gulf of Bothnia. The archipelago sea boat traffic is handled by, among others, S/S Ukkopekka, an old steamship that cruises on the route Turku-Naantali-Turku. Turku has a longer educational history than any other Finnish city – the first school in the city, the Cathedral School, was founded along with the Cathedral of Turku in the late 13th century. The first university in Finland, the "The Royal Academy of Turku" (now University of Helsinki), was established in the city in 1640. In 1820, the first school in Finland conforming to the Bell-Lancaster method was founded in Turku with the aim of making primary education more inclusive to the lower classes. The newspaper, Turun Sanomat, also operates a regional television station, called Turku TV. The Finnish national broadcaster, Yleisradio, screens local news, daily from Monday to Friday, for the Southwest Finland (including the regions of Southwest Finland and Satakunta) residents. All Finnish national TV channels are viewable and national radio channels audible in the Turku area. In addition, a number of local radio stations, e.g. Auran Aallot, Radio Sata and Radio Robin Hood are operational. Local public service radio stations are YLE Turun Radio in Finnish language (the regional version of YLE Radio Suomi) and YLE Radio Vega Åboland in Swedish language (the regional version of YLE Radio Vega). The brothers Saku and Mikko Koivu, Finnish ice hockey players playing respectively in Anaheim Ducks and Minnesota Wild as an alternate captain and captain. The Turku region has also brought forth many prominent personalities, including the marshal, Carl Gustaf Mannerheim. Anttonen, Martti (ed) (1992). Täällä Suomen synnyinmuistot. Jyväskylä: Varsinais-Suomen maakuntaliitto. Knuuti, Heikki et al. (1986). Kotikaupunkini Suomen Turku. Keuruu: Otava Publishing. ^ "Taajamat väkiluvun ja väestöntiheyden mukaan 31.12.2011" (in Finnish). Tiedote. Statistics Finland (Tilastokeskus). 2011-12-31. http://pxweb2.stat.fi/Dialog/varval.asp?ma=160_vaerak_tau_340_fi&ti=Taajamat+v%E4kiluvun+ja+v%E4est%F6ntiheyden+mukaan+31%2E12%2E2011&path=../Database/StatFin/vrm/vaerak/&lang=3&multilang=fi. Retrieved 28 March 2013. ^ "Seutukuntien ennakkoväkiluku alueittain, elokuu 2013" (in Finnish). Tiedote. Statistics Finland (Tilastokeskus). 2013-08-31. http://193.166.171.75/Dialog/Varvalagg.asp?ma=005%5Fvamuu%5Ftau%5F101&ti=Ennakkov%E4kiluku+alueittain%2C+toukokuu+2013&path=../Database/StatFin/vrm/vamuu/&lang=3&xu=&yp=&nr=1&aggfile%281%29=Seutukunnat+2013&prevagg=NN&mapname=&multilang=fi&aggdir1=. Retrieved 2 October 2013. ^ a b "Statistical yearbook of Turku" (in Finnish). 2008-07-17. http://www.turku.fi/Public/default.aspx?nodeid=3981&culture=en-US&contentlan=2. ^ "Christmas City » Turku, the Finnish Christmas City". www.turku.fi. http://www.turku.fi/public/default.aspx?nodeid=9289&culture=en-US&contentlan=2. Retrieved 2009-05-06. ^ "Keskiaika - Suomen kaupungit keskiajalla". Katajala.net. http://www.katajala.net/keskiaika/suomi/kaupungit.html. Retrieved 2011-09-16. ^ "Destinations in Finland - Official Travel and Tourism Guide". Visitfinland.com. http://www.visitfinland.com/W5/index.nsf/(pages)/Destinations. Retrieved 2009-05-06. ^ Aki Pihlman (2006-09-13). "Varhainen Turku rakennettiin pellolle" (in Finnish). http://www.utu.fi/media/ajankohtaista/argumentit/AkiPihlman.html. Retrieved 2008-05-06. ^ Andrew Spicer (2012). Lutheran Churches in Early Modern Europe. Ashgate Publishing, Ltd.. p. 314. ISBN 978-0-7546-6583-0. http://books.google.com/books?id=GyErqszUsFYC&pg=PA314. ^ "Kirjastosilta avattiin tulen ja valon juhlassa". www.turku.fi. http://www.turku.fi/public/?contentid=480599&nodeid=23. Retrieved 2014-01-10. ^ "Normal period 1981-2010". http://en.ilmatieteenlaitos.fi/normal-period-1981-2010. Retrieved 12 October 2012. ^ "www.turku.fi » turku.fi » Turku.info » Publications and Reports". turku.fi. 2008-06-25. http://www.turku.fi/Public/default.aspx?contentid=97662&nodeid=4907&culture=en-US&contentlan=2. Retrieved 2009-05-06. ^ "www.uudenmusiikinfestivaali.org". www.uudenmusiikinfestivaali.org. http://www.uudenmusiikinfestivaali.org/. Retrieved 2011-09-16. ^ "Turku Titans history". Turku Titans. http://www.turkutitans.fi/club.htm. Retrieved 2010-07-18. ^ "2012 World Lacrosse". FIL U19 2012 World Lacrosse Championships. http://www.2012worldlacrosse.com/. Retrieved 2010-07-18. ^ Laaksonen, Mikko. "Raitiovaunulla Naantaliin, Kaarinaan, Runosmäkeen, Varissuolle?" (in Finnish). raitio.org. Finnish Tramways Society. http://www.raitio.org/historia/pika/pika.htm. Retrieved 2008-07-11. ^ "Turun Sanomat". Turunsanomat.fi. 2006-09-27. Archived from the original on May 24, 2011. https://web.archive.org/20110524173404/http://www.turunsanomat.fi/kotimaa/?ts=1,3:1002:0:0,4:2:0:1:2006-09-27,104:2:407945,1:0:0:0:0:0. Retrieved 2009-05-06. ^ "www.turku.fi » turku.fi » Turku.info » Turku in Brief". turku.fi. http://www.turku.fi/Public/default.aspx?nodeid=4904&culture=en-US&contentlan=2. Retrieved 2009-05-06. ^ "Turku International School". University of Turku. 15 January 2006. http://www.tnk.utu.fi/index.php?id=1389&news_id=125&archive=. ^ "Gdańsk Official Website: 'Miasta partnerskie'" (in Polish, English). © 2009 Urząd Miejski w Gdańsku. http://www.gdansk.pl/samorzad,62,733.html. Retrieved 2009-07-11. ^ "Partner (Twin) towns of Bratislava". Bratislava-City.sk. Archived from the original on 2013-07-28. http://web.archive.org/web/20130728183628/http://www.bratislava-city.sk/bratislava-twin-towns. Retrieved 2013-08-05.